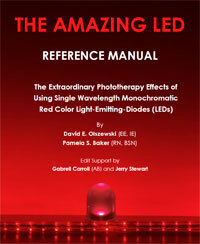 We are providing “The Amazing LED” reference manual for you to use free of charge. To view the manual, press here or on the picture to your left. The manual is an Adobe Reader (.pdf) formatted file and depending on your browser and its settings you will be able to view the file in your browser using the Adobe Reader plug-in, view directly in Adobe Reader installed on your computer or device, or save the file on your computer or device.